Humans love expressing things in numbers. By assigning plain numerical values to abstract concepts, we feel like we can understand and control them better. We also associate higher values with better quality, a preconception marketing often seeks to exploit (“The sequel will be bigger, better, with more exploding CGI dinosaurs!”). Still, when properly utilized and analyzed, they are invaluable to any business, and we recently conducted an NPS survey for that very reason. The Net Promoter Score - NPS for short - is a customer loyalty metric first introduced by Fred Reichheld in 2003. Since then, it has been widely used to assess customer satisfaction. It’s an excellent way to gauge your relationship with customers. An outside perspective does wonders and can point you to a lot of things you would otherwise miss. The score can go from -100 (nobody likes your product) to 100 (everybody loves it). While the score itself does, of course, tell you a lot, it’s not about getting the score higher. The real thing you need to address and focus on is people’s feedback - no matter if it’s good or bad. Depending on the score, these are classified into three main groups: Promoters (they give you 9’s and 10’s), Passives (7’s and 8’s), and Detractors (the rest). These are the customers who award a low score. Usually, the cause for this is some bug they encountered, unsatisfactory communication with support, or app design that doesn’t suit them at all. Some are merely frustrated because their boss is forcing them to use the software. When contacting detractors, first examine all previous contact you had with them: conversations, tickets, etc. Because of this, we decided to forward these people to our customer support team, since they understand bug reporting better and have more experience in handling situations such as these. Even though you can never please everyone, you should always see if there’s anything you can do to make your customers’ time with your product more rewarding. People in this category are probably the best group for interviews. They won’t tell you that you’re awesome, but also won’t be blinded by some recent annoyance like detractors can be. So, we conducted interviews to talk about our product, its features, the best and worst parts, experience with the people in our company, and so on. They appreciate your product, but are missing something that would make them love it. It’s like when you’re shopping, and everything about the product you’ve got your eye on is perfect - except that it doesn’t have some feature, add-on, or extension that would make it an insta-buy. This is the group you should concentrate on and give them a little push to show them that you really care. Above all, don’t neglect them or they will soon transit to become detractors, and eventually churn. The people that love you the most - your biggest fans. You need to contact them to find out what it is that makes your product/brand so valuable to them. With promoters, you want to go into as much detail as possible. That is why we performed a whole new survey just with them, where we asked about their motives when choosing a project management software, which challenges they want to overcome, as well as what is the main difference between us and our main competitors if they had any experience with them. This was a very different project, and we’ll talk about it more in a future blog post. The main thing we do is to ask them if they would be willing to leave a review on one of the software review sites. This is also a project we are working on, so we combined these two and took an opportunity to establish our NPS campaigns as a constant source of reviews. You can offer your potential reviewers something in return (gift cards, a discount on their next purchase, etc. ), but if you’re not in a position to offer them a reward, don’t worry - you’ll be surprised how inclined they are to leave a review when they love your product and are a happy customer. Over time, we developed a strong relationship with some of our promoters. We’ll often work on bigger projects with them, such as exchanging guest posts or publishing a collaborative article about a mutual topic. Also, these are the companies we find the most interesting in terms of the business they do or the ways in which they use ActiveCollab. Those usually turn out to be the perfect topics for them to write about in our testimonials. 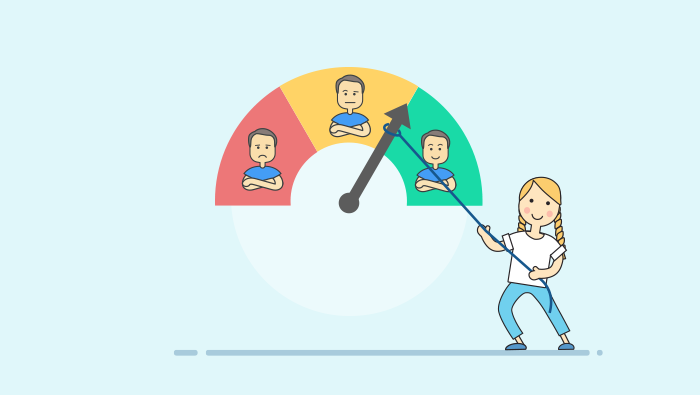 You shouldn’t obsess about the NPS score - what you should concentrate on is digging deep and getting to as many people as possible so you can get as much useful feedback as you can. It’s important to compose the questions in just the right way, as you don’t want to have answers that are formulated to give suggestive or wrong impressions, which is a very common mistake. At first, you’ll be convinced that all is well concerning your brand/product, but they will tell you what is really up and soon set you straight. This way you can focus on the problems, bugs, and actual changes and improvements people want from you, and not those you wish were a part of your product/app. Only then will your NPS score go up. At the end of the day you won’t be hung up on that number, but rather on the complaints, useful critiques, and suggestions and how you can solve them and improve your products and services. Because, when you do, and you receive positive feedback full of gratitude - there’s no better feeling.